Thank you for the informative article, I would love to know more about the visual regression tool. We have tried many different ones for image comparison, but none worked as we hoped. We've written our own image comparison in Java that makes use of ImageMagick compare via command line to highlight visual differences between versions. But I wanted to thank you for describing your four real-live challenges. 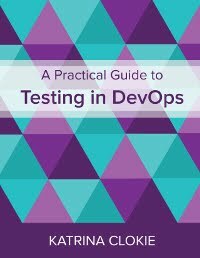 I'd like to know, for those scenarios, how much do you trust your tests? Example 1 sounds interesting, as it treats test code like production code, has many contributors and people are informed about the problems, people double-check what has been implemented, etc. Would you say that that team trusts their automated tests? The team with the targeted tools and the smoke test suite, I'd be interested how much they actually double-check, unintentional of course, but covering the same ground twice, once per script, once "manually". Thanks again for sharing your, as always, well analyzed insights. Interesting post, but can you elaborate a bit more on mocking the test data? In what are you doing it? That's certainly one of the problems that we face, someone messes with the test data (for whatever reason) and tests fail. We're written our own lightweight web server in node.js that returns mock responses for testing in place of our normal web services layer. "To see a successful execution in this full stack approach we needed everything in our test environment to be working and stable, not just the application being tested. This was sometimes a difficult thing to achieve." In my view, this is a hugely important thing for testers to notice, for several reasons. Let me offer three. First, it is a test result in its own right. It may point to testability problems intrinsic to the product, or to project-related problems. Second, problems in the test environment may reveal problems in the product that manifest when the production environment is not running perfectly well. Third, dealing with these problems reduces the amount of scrutiny you can give to the product; that is, dealing with these problems reduces coverage. This third problem is a particularly big deal, because in any project, we have a finite amount of time to develop and test the product. Out of the universe of all the problems that we could find, the problems that we do find in that constrained time are the easiest ones. We don't find the harder, deeper, more rare, more subtle, more intermittent problems. Every minute we struggle against the current is another minute that we can't spend finding deeper bugs. My observation is that, in general, testers aren't terribly great at relating such problems to undiscovered bugs and the associated business risk. Maintenance at Maturity - shared ownership is worst ownership. "Every build failure will create a message in the testing team chat" - this brought back memories for me. I remember being in a team like this - we didn't want to bother the developers with all the failures because they would complain it was "too noisy", and we'd only just managed to get them to pay attention to test failures at all. In my experience, if you want developers to help with the maintenance then it requires a massive cultural shift in the development team. The only way I've seen this shift work is when management decisively announces that developers are the sole owners of the test suite, and testers are now only responsible for the tooling. I can't say it was popular, but it did work. It required a firm hand and a lot of buy-in from the teams. Targeted Tools - "When they do fail, it's often due to environmental issues in the test environments." I bet at some point one of you has questioned if these tests even have value at all, and if you should just retire them. Where did you land on that and why? What kind of real bugs are they detecting and is there a cheaper way to detect these issues? Moving to Mock - This is an awesome move, and well worth the adoption pain in my opinion. I'm going to guess that part of the reason it's so hard to convince people to move to them is because the dev teams are not already feeling the pain of full stack testing because the test team absorbs it for them. This might be an easier move if you can tie it in with the ownership change as a kind of gift - "yes we know these tests are currently hard to maintain but we ultimately want to increase your productivity, not decrease it. To that end, we are are working on making it easier for you by providing the following solutions: mocked data, etc etc"
- How complex are these mobile apps? Given the high rate of change, how much time does it take to do a smoke test manually? Is it really worth automating these smoke tests if it only takes 5-10 minutes to do by hand (especially if you're spending much more time maintaining the automated tests)? Can you rotate the manual smoke test among team members, or outsource it to someone cheap? - Do you have access to any crawler-type tools that will do simple crawling / crash detection on your apps? This might be a half-decent type of automated smoke test that doesn't require as much maintenance. - If manual testing takes too long, can you create a halfway solution and use tool-assisted manual testing? e.g. Seed data to create forced states, automatic user setup, automatic build installation, etc.